This article is about the instrument. For the inventor, see Léon Theremin. For the Covenant album, see Theremin (album). For the 1993 documentary, see Theremin: An Electronic Odyssey. The theremin (/ˈθɛrəmɪn/; originally known as the ætherphone/etherphone, thereminophone or termenvox/thereminvox) is an electronic musical instrument controlled without physical contact by the thereminist (performer). It is named after the Westernized name of its Soviet inventor, Léon Theremin (Лев Термен), who patented the device in 1928. A Moog Etherwave, assembled from a theremin kit: the loop antenna on the left controls the volume while the upright antenna controls the pitch. J. S. Bach's Jesu, Joy of Man's Desiring played by Italian thereminist Fabio Pesce on a Moog Etherwave theremin. The instrument's controlling section usually consists of two metal antennas that sense the relative position of the thereminist's hands and control oscillators for frequency with one hand, and amplitude (volume) with the other. The electric signals from the theremin are amplified and sent to a loudspeaker. The sound of the instrument is often associated with eerie situations. Thus, the theremin has been used in movie soundtracks such as Miklós Rózsa's Spellbound and The Lost Weekend, Bernard Herrmann's The Day the Earth Stood Still, and Justin Hurwitz's First Man, as well as in theme songs for television shows such as the ITV drama Midsomer Murders. The theremin is also used in concert music (especially avant-garde and 20th- and 21st-century new music), and in popular music genres such as rock. The theremin was the product of Soviet government-sponsored research into proximity sensors. The instrument was invented by a young Russian physicist named Lev Sergeyevich Termen (known in the West as Léon Theremin) in October 1920 after the outbreak of the Russian Civil War. After a lengthy tour of Europe, during which time he demonstrated his invention to packed houses, Theremin moved to the United States, where he patented his invention in 1928. Subsequently, Theremin granted commercial production rights to RCA. Although the RCA Thereminvox (released immediately following the Stock Market Crash of 1929) was not a commercial success, it fascinated audiences in America and abroad. Clara Rockmore, a well-known thereminist, toured to wide acclaim, performing a classical repertoire in concert halls around the United States, often sharing the bill with Paul Robeson. During the 1930s, Lucie Bigelow Rosen was also taken with the theremin and together with her husband Walter Bigelow Rosen provided both financial and artistic support to the development and popularisation of the instrument. 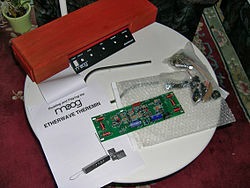 The components of a modern Moog theremin, in kit form. Since the release of the film Theremin: An Electronic Odyssey in 1993, the instrument has enjoyed a resurgence in interest and has become more widely used by contemporary musicians. 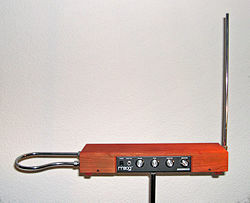 Even though many theremin sounds can be approximated on many modern synthesizers, some musicians continue to appreciate the expressiveness, novelty, and uniqueness of using an actual theremin. The film itself has garnered excellent reviews. Both theremin instruments and kits are available from manufacturers such as Moog Music Inc., Burns Theremins, Harrison Instruments, Inc., Theremaniacs LLC, PAiA Corporation USA, and Jaycar Electronics. Some inexpensive theremins may only have a pitch control and may be harder to play accurately because of a relatively non-linear relationship between the distance of the hand and resultant pitch, as well as a relatively short span of hand-to-antenna distance for producing the available range of pitch. Block diagram of a theremin. Volume control in lavender, pitch control in yellow and audio output in salmon. The theremin is distinguished among musical instruments in that it is played without physical contact. The thereminist stands in front of the instrument and moves his or her hands in the proximity of two metal antennas. The distance from one antenna determines frequency (pitch), and the distance from the other controls amplitude (volume). Higher notes are played by moving the hand closer to the pitch antenna. Louder notes are played by moving the hand away from the volume antenna. Most frequently, the right hand controls the pitch and the left controls the volume, although some performers reverse this arrangement. Some low-cost theremins use a conventional, knob operated volume control and have only the pitch antenna. While commonly called antennas, they are not used for receiving or broadcasting radio waves, but act as plates of capacitors. The theremin uses the heterodyne principle to generate an audio signal. The instrument's pitch circuitry includes two radio frequency oscillators set below 500 kHz to minimize radio interference. One oscillator operates at a fixed frequency. The frequency of the other oscillator is almost identical, and is controlled by the performer's distance from the pitch control antenna. The performer's hand acts as the grounded plate (the performer's body being the connection to ground) of a variable capacitor in an L-C (inductance-capacitance) circuit, which is part of the oscillator and determines its frequency. In the simplest designs, the antenna is directly coupled to the tuned circuit of the oscillator and the 'pitch field', that is the change of note with distance, is highly nonlinear, as the capacitance change with distance is far greater near the antenna. In such systems, when the antenna is removed, the oscillator moves up in frequency. To partly linearise the pitch field, the antenna may be wired in series with an inductor to form a series tuned circuit, resonating with the parallel combination of the antenna's intrinsic capacitance and the capacitance of the player's hand in proximity to the antenna. This series tuned circuit is then connected in parallel with the parallel tuned circuit of the variable pitch oscillator. With the antenna circuit disconnected, the oscillator is tuned to a frequency slightly higher than the stand alone resonant frequency of the antenna circuit. At that frequency, the antenna and its linearisation coil present an inductive impedance; and when connected, behaves as an inductor in parallel with the oscillator. Thus, connecting the antenna and linearising coil raises the oscillation frequency. Close to the resonant frequency of the antenna circuit, the effective inductance is small, and the effect on the oscillator is greatest; farther from it, the effective inductance is larger, and fractional change on the oscillator is reduced. When the hand is distant from the antenna, the resonant frequency of the antenna series circuit is at its highest; i.e., it is closest to the free running frequency of the oscillator, and small changes in antenna capacitance have greatest effect. Under this condition, the effective inductance in the tank circuit is at its minimum and the oscillation frequency is at its maximum. The steepening rate of change of shunt impedance with hand position compensates for the reduced influence of the hand being further away. With careful tuning, a near linear region of pitch field can be created over the central 2 or 3 octaves of operation. Using optimized pitch field linearisation, circuits can be made where a change in capacitance between the performer and the instrument in the order of 0.01 picofarads produces a full octave of frequency shift. The mixer produces the audio-range difference between the frequencies of the two oscillators at each moment, which is the tone that is then wave shaped and amplified and sent to a loudspeaker. To control volume, the performer's other hand acts as the grounded plate of another variable capacitor. As in the tone circuit, the distance between the performer's hand and the volume control antenna determines the capacitance and hence natural resonant frequency of an LC circuit inductively coupled to another fixed LC oscillator circuit operating at a slightly higher resonant frequency. When a hand approaches the antenna, the natural frequency of that circuit is lowered by the extra capacitance, which detunes the oscillator and lowers its resonant plate current. In the earliest theremins, the RF plate current of the oscillator is picked up by another winding and used to power the filament of another diode-connected triode, which thus acts as a variable conductance element changing the output amplitude. The harmonic timbre of the output, not being a pure tone, was an important feature of the theremin. Theremin's original design included audio frequency series/parallel LC formant filters as well as a 3-winding variable-saturation transformer to control or induce harmonics in the audio output. Modern circuit designs often simplify this circuit and avoid the complexity of two heterodyne oscillators by having a single pitch oscillator, akin to the original theremin's volume circuit. This approach is usually less stable and cannot generate the low frequencies that a heterodyne oscillator can. Better designs (e.g., Moog, Theremax) may use two pairs of heterodyne oscillators, for both pitch and volume. Important in theremin articulation is the use of the volume control antenna. Unlike touched instruments, where simply halting play or damping a resonator in the traditional sense silences the instrument, the thereminist must "play the rests, as well as the notes", as Clara Rockmore observed. If the pitch hand is moved between notes, without first lowering the volume hand, the result is a "swooping" sound akin to a swanee whistle or a glissando played on the violin. Small flutters of the pitch hand can be used to produce a vibrato effect. To produce distinct notes requires a pecking action with the volume hand to mute the volume while the pitch hand moves between positions. Thereminists such as Carolina Eyck use a fixed arm position per octave, and use fixed positions of the fingers to create the notes within the octave, allowing very fast transitions between adjacent notes. Although volume technique is less developed than pitch technique, some thereminists have worked to extend it, especially Pamelia Kurstin with her "walking bass" technique and Rupert Chappelle. Recent versions of the theremin have been functionally updated: the Moog Ethervox, while functionally still a theremin, can also be used as a MIDI controller, and as such allows the artist to control any MIDI-compatible synthesizer with it, using the theremin's continuous pitch to drive modern synths. The Harrison Instruments Model 302 Theremin uses symmetrical horizontal plates instead of a vertical rod and horizontal loop to control pitch and volume, with the volume increasing as the hand approaches the plate. Music From The Ether  manufactures a modernized vacuum tube replica of the RCA AR-1264 and a transistorized theremin which the customer may customize with most any wood species they desire as well as many available tolex colors with matching knobs. The critic Harold C. Schonberg described the sound of the theremin as "(a) cello lost in a dense fog, crying because it does not know how to get home." Concert composers who have written for theremin include Bohuslav Martinů, Percy Grainger, Christian Wolff, Joseph Schillinger, Moritz Eggert, Iraida Yusupova, Jorge Antunes, Vladimir Komarov, Anis Fuleihan, and Fazıl Say. Another large-scale theremin concerto is Kalevi Aho's Concerto for Theremin and Chamber Orchestra "Eight Seasons" (2011), written for Carolina Eyck. Maverick composer Percy Grainger chose to use ensembles of four or six theremins (in preference to a string quartet) for his two earliest experimental Free Music compositions (1935–37) because of the instrument's complete 'gliding' freedom of pitch. Musician Jean Michel Jarre used the instrument in his concerts Oxygen In Moscow and Space of Freedom in Gdańsk, providing also a short history of Léon Theremin's life. The five-piece Spaghetti Western Orchestra use a Theremin as a replacement for Edda Dell'Orso's vocals in their interpretation of Ennio Morricone's "Once Upon a Time in the West". Other notable contemporary Theremin players include Lydia Kavina, Pamelia Kurstin, Barbara Buchholz and Katica Illényi. Dutch classical musician Thorwald Jørgensen has been described as "one of the most important exponents of classical music on the theremin". On 20 July 2013, a group of 272 theremin players (Matryomin ensemble) in Hamamatsu, Shizuoka, Japan, achieved a Guinness world record as the largest theremin ensemble. The name Matryomin is a portmanteau of the words matryoshka and theremin. Theremins and theremin-like sounds started to be incorporated into popular music from the end of the 1940s (with a series of Samuel Hoffman/Harry Revel collaborations) and this has continued, with varying popularity, to the present. Lothar and the Hand People were the first rock band known to perform live with a theremin in November 1965. In fact, Lothar was the name they gave to their Moog theremin. The Beach Boys' 1966 single "Good Vibrations" – though it does not technically contain a theremin – is the most frequently cited example of the instrument in pop music. The song actually features a similar-sounding instrument invented by Paul Tanner called an Electro-Theremin. Upon release, the single prompted an unexpected revival in theremins and increased the awareness of analog synthesizers. In response to requests by the band, Moog Music began producing their own brand of ribbon-controlled instruments which would mimic the sound of a theremin. Jimmy Page of Led Zeppelin used a variation of the theremin (pitch antenna only) during performances of "Whole Lotta Love" and "No Quarter" throughout the performance history of Led Zeppelin, an extended multi-instrumental solo featuring theremin and bowed guitar in 1977, as well as the soundtrack for Death Wish II, released in 1982. Brian Jones of the Rolling Stones also used the instrument on the group's 1967 albums Between the Buttons and Their Satanic Majesties Request. The Lothars are a Boston-area band formed in early 1997 whose CDs have featured as many as four theremins played at once – a first for pop music. Although credited with a "Thereman" [sic] on the "Mysterons" track from the album Dummy, Portishead actually used a monophonic synthesizer to achieve theremin-like effects, as confirmed by Adrian Utley, who is credited as playing the instrument; on the songs "Half Day Closing", "Humming", "The Rip", and "Machine Gun" he has actually used a custom made theremin. Russian composer Dmitri Shostakovich was one of the first to incorporate parts for the theremin in orchestral pieces, including a use in his score for the film Odna (Russian: Одна – 1931, Leonid Trauberg and Grigori Kozintsev). While the theremin was not widely used in classical music performances, the instrument found great success in many motion pictures, notably, Spellbound, The Red House, The Lost Weekend (all three of which were written by Miklós Rózsa, the composer who pioneered the use of the instrument in Hollywood scores), The Spiral Staircase, Rocketship X-M, The Day the Earth Stood Still, The Thing (From Another World), Castle In the Air, and The Ten Commandments (the 1956 DeMille film). The theremin is played and identified as such in use in the Jerry Lewis movie The Delicate Delinquent. The theremin is prominent in the score for the 1956 short film A Short Vision, which was aired on The Ed Sullivan Show the same year that it was used by the Hungarian composer Matyas Seiber. More recent appearances in film scores include Monster House, Ed Wood and The Machinist (both featuring Lydia Kavina), as well as First Man (2018). A theremin was not used for the soundtrack of Forbidden Planet, for which Louis and Bebe Barron built disposable oscillator circuits and a ring modulator to create the electronic tonalities used in the film. Los Angeles-based thereminist Charles Richard Lester is featured on the soundtrack of Monster House and has performed the US premiere of Gavriil Popov's 1932 score for Komsomol – Patron of Electrification with the L. A. Philharmonic and Esa-Pekka Salonen in 2007. In Lenny Abrahamson's 2014 film, Frank, Clara, the character played by Maggie Gyllenhaal, plays the theremin in a band named Soronprfbs. Star Trek did not use a theremin. The Alexander Courage theme music composed for and employed on the original series was performed by a mixture of instruments with vocals to get "unearthly" sound. The theremin-like sound theme was actually provided by renowned studio soprano Loulie Jean Norman until her voice was removed in later seasons. Soprano Elin Carlson sang part of the theme when CBS-Paramount TV remastered the program's title sequence in 2006. In May 2007, the White Castle American hamburger restaurant chain introduced a television ad centered around a live theremin performance by musician Jon Bernhardt of the band The Lothars. It is the only known example of a theremin performance being the focus of an advertisement. Celia Sheen plays the theremin in the Midsomer Murders series. In October 2008, comedian, musician, and theremin enthusiast Bill Bailey played a theremin during his performance of Bill Bailey's Remarkable Guide to the Orchestra at the Royal Albert Hall, which has subsequently been televised. He has previously also written an article, presented a radio show and incorporated the theremin in some of his televised comedy tours. Lydia Kavina's solo theremin is featured on the soundtrack for the 2006 MMORPG computer game Soul of the Ultimate Nation, composed by Howard Shore. They were played in succession six times over the span of three days from August–September 2001 during the transmission of Teen Age Message, an interstellar radio message. The Ondes-Martenot, 1928, also uses the principle of heterodyning oscillators, but has a keyboard as well as a slide controller and is touched while playing. The Electro-Theremin (or Tannerin after Paul Tanner who played it in several productions including three tracks for The Beach Boys), built by Bob Whitsell in the 1950s, does not use heterodyning oscillators and has to be touched while playing, but it allows continuous variation of the frequency range and sounds similar to the theremin. The same instrument was also used to generate the outer space sounds for George Greeley's theme to the TV show My Favorite Martian. Trautonium, a monophonic electronic musical instrument by Friedrich Trautwein, invented in 1929. The Persephone, an analogue fingerboard synthesizer with CV and MIDI, inspired by the trautonium. The Persephone allows continuous variation of the frequency range from one to 10 octaves. The ribbon is pressure and position sensitive. The Electronde, an early prototype of the theremin, invented in 1929 by Martin Taubman. It has an antenna for pitch control, a handheld switch for articulation and a foot pedal for volume control. The Syntheremin is an extension of the theremin. The Croix Sonore (Sonorous Cross), is based on the theremin. It was developed by Russian composer Nicolas Obouchov in France, after he saw Lev Theremin demonstrate the theremin in 1924. The terpsitone, also invented by Theremin, consisted of a platform fitted with space-controlling antennas, through and around which a dancer would control the musical performance. By most accounts, the instrument was nearly impossible to control. Of the three instruments built, only the last one, made in 1978 for Lydia Kavina, survives today. The Z.Vex Effects Fuzz Probe, Wah Probe and Tremolo Probe, using a theremin to control said effects. The Fuzz Probe can be used as a theremin, as it can through feedback oscillation create tones of any pitch. The Haken Continuum Fingerboard uses a continuous, flat playing surface along which the player slides his fingers to create the desired pitch and timbre values. Describable as "a continuous pitch controller that resembles a keyboard, but has no keys." The MC-505 by Roland by being able to use the integrated D-Beam-sensor like a Theremin. The Otamatone by the Cube Works company, which is played by sliding the fingers up and down a stem to control a three-level pitch sound. The Audiocubes by Percussa are light emitting smart blocks that have four sensors on each side (optical theremin). The sensors measure the distance to your hands to control an effect or sound. A musical saw, also called a singing saw, is the application of a hand saw as a musical instrument. The sound creates an ethereal tone, very similar to the theremin. The musical saw is classified as a friction idiophone with direct friction (131.22) under the Hornbostel-Sachs system of musical instrument classification. A three radio theremin (Super Theremin, スーパーテレミン) invented by Tomoya Yamamoto (山本智), composed of three independent radio sets. Radio set #1 is to listen and to record the signal at around 1600 kHz. Radio set #2 is tuned at 1145 kHz so that its local oscillator of around 1600 kHz is to be received by radio set #1. Radio set #3 is also tuned at 1145 kHz so that its local oscillator may produce the beat with radio set #2. Operator's hand movement around bar antenna of radio set #3 may affect the local oscillator to produce tonal change. The Matryomin by Masami Takeuchi, is a single-antenna Theremin-type device mounted inside a Matryoshka doll (aka Russian Doll). The Chimaera is a digital offspring of theremin and touchless ribbon controller and based on distance sensing of permanent magnets. An array of linear Hall-effect sensors, each acting as an individual theremin in a changing magnetic field, responds to multiple moving neodymium magnets worn on fingers and forms a continuous interaction space in two dimensions. ^ Glinsky, Albert (2000). Theremin: Ether Music and Espionage. Urbana, Illinois: University of Illinois Press. p. 26. ISBN 978-0-252-02582-2. ^ Tell Me More, BBC, h2g2 project, Undated.Accessed:05-20-2008. ^ "Channel Road Amplification: Vacuum Tube Theremin". www.channelroadamps.com. ^ "RCA Theremin circuit diagram". ^ "How is the Electro-Theremin different from the traditional theremin?". ^ Vennard, Martin (1929-03-12). "BBC News – Leon Theremin: The man and the music machine". Bbc.co.uk. Retrieved 2012-03-13. ^ Moog, Bob (2002-10-26). "Theremin Vox – In Clara's Words". Thereminvox.com. Retrieved 2012-03-13. ^ a b c d e f "Lydia Kavina Music from the Ether". Mode Records. Retrieved 16 April 2010. ^ a b "Barbara Buchholz / Lydia Kavina / Kammerensemble Neue Musik Berlin – Touch! Don't Touch! – Works For Theremin". discogs.com. Retrieved 16 April 2010. ^ "Anis Fuleihan (Composer, Arranger)". bach-cantatas.com. 2007-06-10. Retrieved 16 April 2010. ^ "Ionisation: Thomas Arne, Ludwig van Beethoven, Edward Elgar, Anis Fuleihan, Edgard Varese, Arturo Toscanini, Henry J. Wood, Jean Sibelius, Leopold Stokowski, Nicolas Slonimsky, Wilhelm Furtwängler, BBC Symphony Orchestra, London Symphony Orchestra, New York Symphony Orchestra, Vienna Philharmonic Orchestra, Clara Rockmore: Music". Retrieved 2012-03-13. ^ "Carolina Eyck". Archived from the original on 7 July 2012. Retrieved 25 June 2012. ^ Lewis, Thomas P (1991). A source guide to the music of Percy Grainger, chapter 4: Program notes. White Plains: Pro-Am Music Resources. ISBN 978-0-912483-56-6. Retrieved 2011-09-21. ^ ": Jean Michel Jarre Official Website :: Live-o-graphy :: Gdansk – 2005". Jeanmicheljarre.com. 2009-05-20. Archived from the original on 2012-02-24. Retrieved 2012-03-13. ^ "BBC Proms Review: Spaghetti Western Orchestra". i-flicks.net. Archived from the original on 2012-10-28. Retrieved 14 January 2012. ^ "Lydia Kavina Biography". All Music. Retrieved 14 February 2017. ^ "Pamela Kurstin Biography". All Music. Retrieved 14 February 2017. ^ Barbara Bucholz. "BBC Artists". BBC Music. Retrieved 14 February 2017. ^ Katica Illenyi. "All-Metal-Stars". Vivaldi Metal Project. Archived from the original on 2017-02-15. Retrieved 14 February 2017. ^ "El instrumento que no se toca tiene su propio festival en GAM" (in Spanish). Diario Uchile. 6 November 2014. Retrieved 2 April 2015. ^ mandarinelectron (31 July 2013). "Matryomin ensemble set the world record for the "Largest theremin ensemble"" – via YouTube. ^ "IEEEGHN: The Theremin". IEEE. 2008. Retrieved 2008-10-22. ^ Hayward, Philip (December 1997). "Danger! Retro-Affectivity! : The Cultural Career of the Theremin". Convergence: The International Journal of Research into New Media Technologies. 3 (4): 28–53. doi:10.1177/135485659700300405. ^ Brend 2005, p. 16. ^ Pinch & Trocco 2009, pp. 102–103. ^ Pinch & Trocco 2009, pp. 102–3. ^ A Simple Theremin Project Archived 2010-08-21 at the Wayback Machine. University of Illinois at Urbana–Champaign. ^ Pomerantz, Dorothy (September 17, 1998). "The Lothars revive the spooky sounds of the theremin". Somerville Journal. ^ "Interview with Adrian Utley on Soundonsound, June 1995". Soundonsound.com. Retrieved 2012-03-13. ^ "Auction of No 1 Electronics theremin, A. Utley". spheremusic.com. 2008-04-01. Retrieved 2018-08-18. ^ "A Short Vision". youtube. ^ "Full cast and crew for Maquinista, El". Internet Movie Database. Retrieved 2007-09-01. ^ "Forbidden Planet". MovieDiva. Retrieved 2006-08-16. ^ cokerbl (21 July 2006). "Monster House (2006)". IMDb. ^ "L. A. Philharmonic concert details". Laphil.com. Archived from the original on 2009-09-17. Retrieved 2012-03-13. ^ Lane, Anthony, "Hide and Seek", The New Yorker, August 25, 2014. ^ Solow, Herbert F.; Justman, Robert H. (June 1997). Inside Star Trek The Real Story. Simon & Schuster. pp. 351–352. ISBN 978-0-671-00974-8. ^ Elin Carlson's website, Undated. Accessed: 05-20-2008. ^ "White Castle Ad on YouTube". Youtube.com. 2008-06-28. Retrieved 2012-03-13. ^ Laban, Linda (May 7, 2007). "The geek who captured the Castle". The Boston Globe. pp. C4, C8. ^ McGoogan, Cara (8 March 2016). "Clara Rockmore: Story of the theremin virtuoso who inspired Led Zeppelin and The Rolling Stones". The Telegraph – via www.telegraph.co.uk. ^ Bill Bailey (2004-10-18). "Bill Bailey's Weird Science Guardian article, Oct 2004". Guardian. Retrieved 2012-03-13. ^ "Good Vibrations: The Story of the Theremin, Oct 2004". Bbc.co.uk. 2004-10-21. Retrieved 2012-03-13. ^ Conditt, Jessica (2012-03-08). "Ode to Joystick". GameDaily. Archived from the original on September 14, 2009. Retrieved 2012-03-13. ^ a b Zaitsev, A.L. (2008). "The first musical interstellar radio message". Journal of Communications Technology & Electronics. 53 (9): 1107–1113. doi:10.1134/S106422690809012X. ^ Bloch, Thomas. "ONDES MARTENOT **** THOMAS BLOCH – the instrument : videos, pictures, works, facts..." Retrieved 11 March 2010. ^ "Tannerin 2004". Retrieved 2010-01-22. ^ "The Paul Tanner Electro-Theremin Page". Retrieved 2010-01-22. ^ Taubman demonstrates his Electronde. Stills and a downloadable video at British Pathe news archive. 1938-12-12. ^ "Create Optical Theremin using Percussa AudioCubes". Archived from the original on 2012-10-14. ^ "Super Theremin utilizing three radio sets". Brend, Mark (2005). Strange Sounds: Offbeat Instruments and Sonic Experiments in Pop (1. ed.). San Francisco, Calif.: Backbeat. ISBN 9780879308551. Eyck, Carolina (2006). The Art of Playing the Theremin. Berlin: SERVI Verlag. ISBN 978-3-933757-08-1. Glinsky, Albert (2000). Theremin: Ether Music and Espionage. Urbana, Illinois: University of Illinois Press. ISBN 978-0-252-02582-2. Pinch, T. J; Trocco, Frank (2009). Analog Days: The Invention and Impact of the Moog Synthesizer. Harvard University Press. ISBN 978-0-674-04216-2. Martin, Steven M. (Director) (1995). Theremin: An Electronic Odyssey (Film and DVD). Orion/MGM. Lydia Kavina, Clara Rockmore (featuring), William Olsen (Director) (1995). Mastering the Theremin (Videotape (VHS) and DVD). Moog Music and Little Big Films. Wikimedia Commons has media related to Theremin. Moriarty, Philip (2009). "The Theremin". Sixty Symbols. Brady Haran for the University of Nottingham.